Some of the Dutch cycleways are used so heavily, that they have reached their capacity. This means the authorities need to come up with innovative solutions to make cycling convenient and attractive again at those locations. Protected (separated) cycleways are still the best solution for cycling where main motor traffic routes and main cycle routes coincide. 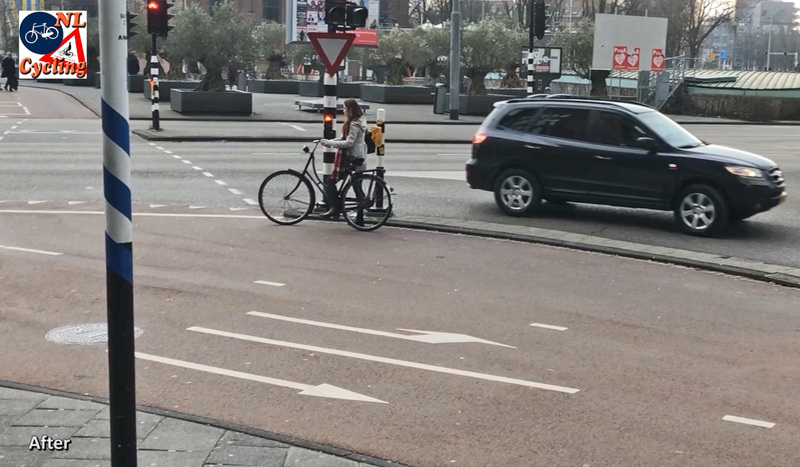 Amsterdam came up with ingenious solutions – at some of its junctions – to get the increased cycle traffic flowing again. The Mr. Visserplein is a fine example. This busy cycle crossing featured on my blog in 2013, but that was before it had the Banana and the Chips or French Fries Cone! At the Amsterdam Mr. Visserplein you need to cross this main road. There is no way you can combine cycling and motor traffic on such roads. If the cycleways are at capacity at such locations drastic measures must be taken. You either widen the cycleways or reduce the motor traffic volume. Two years ago, the city of Amsterdam established that cycling had increased by over 40% in the last 20 years. This causes challenges. Bicycle parking is one of these challenges and overcrowded cycleways is another. The city searched for solutions to get the cycle traffic flowing again in an attractive and safe way. There is the never-ending story of the mopeds/scooters on the cycleways, that has – sort of – been addressed earlier this year. Older scooters are now banned from the innercity, the ban can be enforced in the coming months (after a period to get used to the new rules ends) and then in 2019 the slower type may finally be banned from the cycleways too. But that doesn’t help the crossing of Mr. Visserplein now. This is a place where 20,000 people pass on their bicycles on every working day. 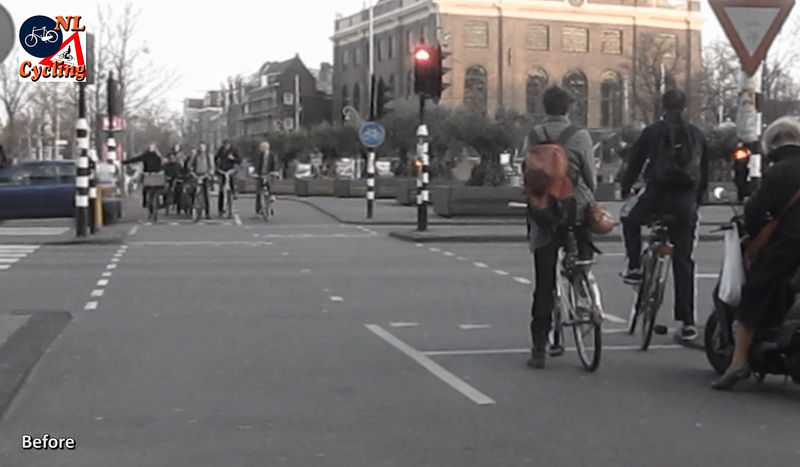 The cycle crossing was already 4.5 metres wide, but it was not enough in rush hour as my earlier video demonstrated. 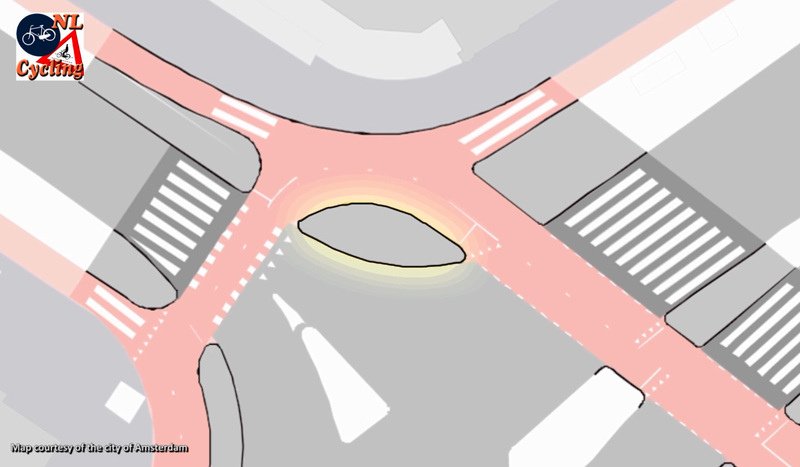 To find out if the settings of the traffic lights could be improved, the University of Amsterdam was asked to investigate this intersection and they did that in cooperation with Copenhagenize. 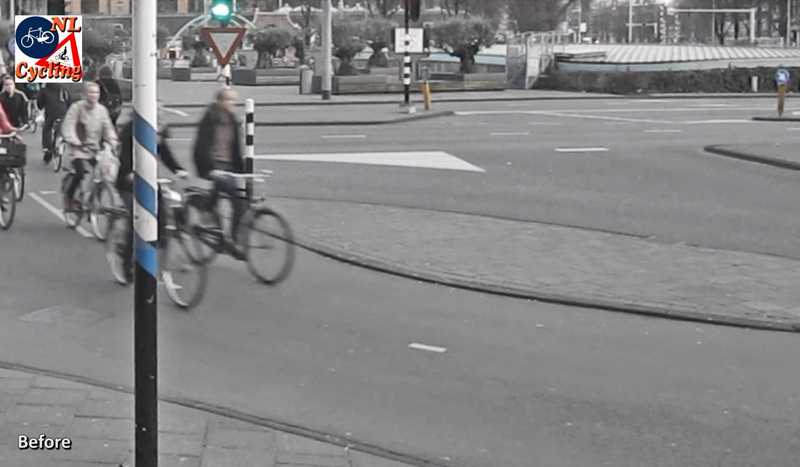 The “desire lines” study found that 90% of the people cycling here adhered to the rules, even when the design of this intersection made that quite hard. The main take away from this investigation for the traffic experts of the city is that you need to design in such a way that it facilitates people’s natural behaviour. That way the chance that they follow the design and its rules is the highest. The city of Amsterdam wanted to improve 10 intersections after this investigation, because it showed swift action was needed. But the capacity improvements had to be achieved with minimal interventions, due to financial and space constraints. At the Mr. Visserplein the cycleways were widened in the Summer of 2016. At the same time the protective traffic islands were redesigned and the road markings were altered. 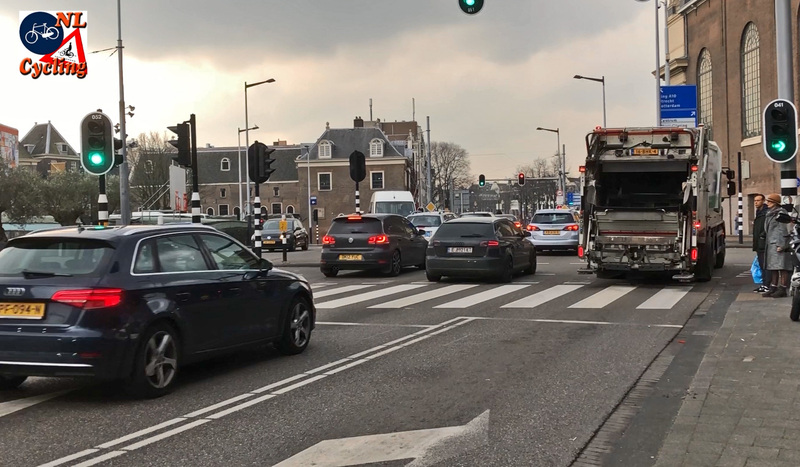 A team of experts of the city of Amsterdam has designed various solutions and came up with these now award-winning solutions to apply to very busy intersections with a lot of cyclists. The traditional protecting traffic island was quite large at this intersection. It rendered valuable space unusable. 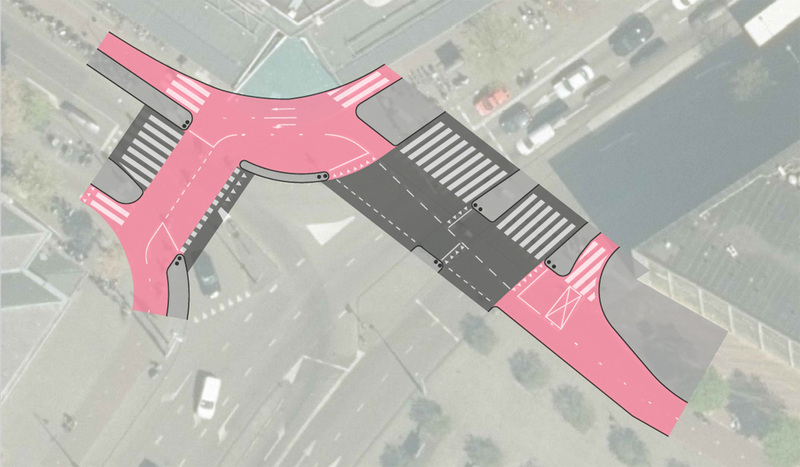 By changing the island from a petal-shape to a banana-shape a lot of that previously unused space can now be used for cycling. In this case the city opted for the absolute minimal size. This size is dictated by the turning radii combined with the width of the kerb stones. It also needed to be big enough for a post with the traffic signal. The much smaller new size can mean that sometimes there is no longer space for drainage, but fortunately that was still possible here. After introducing the “banana”, the size of some other islands was also decreased. Again to increase the usable space. The zebra crossing was very wide, at 6 metres. The legal minimum width in the Netherlands is 4 metres. 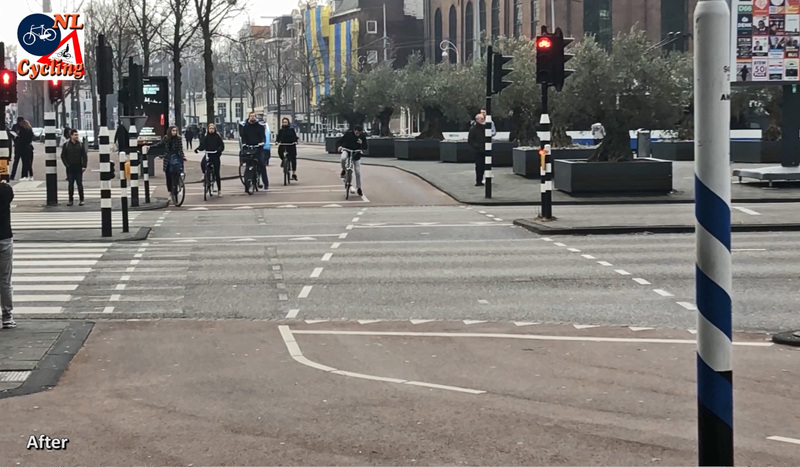 The width of the new zebra crossing at Mr. Visserplein was reduced to 5 metres, still well over the legal required width. That one metre was to be used for the cycle crossing. By removing the elephant’s feet or the stripes between a zebra crossing and a cycle crossing (the type of markings depends on the priority) another metre can be gained. These markings are not legally required. With these measures there was now space for a 6.5-metre-wide cycle crossing at this location; two metres wider than it used to be. However, what increased the capacity of this crossing even more, is the innovative diagonal centre line that keeps cycle traffic in the two directions apart. 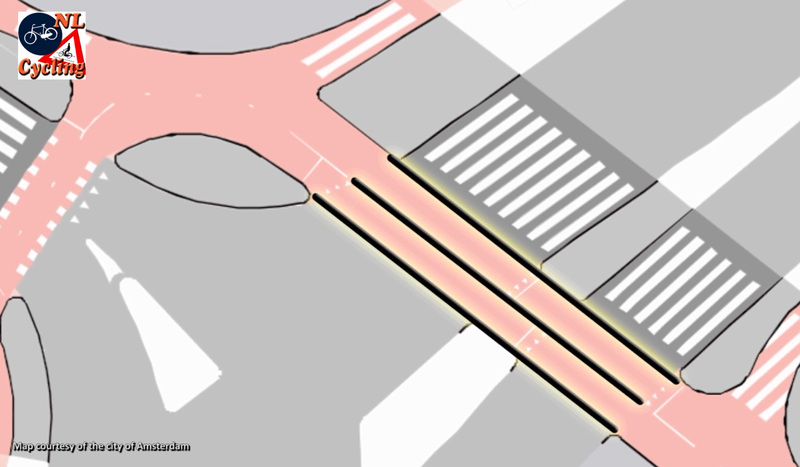 By placing the centre line diagonally the waiting space at the light could be 4.5 metres wide. That is the entire former width! The remaining two metres are for traffic exiting the crossing. At the other end the situation is reversed, creating two cone shapes. Since French fries are usually served in cones in the Netherlands this new shape was soon dubbed the “Frietzak”, meaning “French Fries Cone” (“Chips cone” if you’re British). Before: the large traditionally shaped corner island takes up a lot of space. With the new banana-shaped corner island there is now a waiting area of 2.59 metres wide and two lanes in the other direction of 1.8 metres wide. All the space is needed in rush hour! The former straight crossing. You can already see that people stand on the wrong side of the lines across the street. This natural behaviour was now facilitated. The new crossing. The waiting areas at either end of the crossing are now the full width of the former crossing. You can see that the lines of the zebra crossing were shortened. There is fewer space between the zebra crossing and the cycle crossing. You can also see that the people waiting on the other side of the crossing have much more space to wait, making the experience more convenient. The diagonal lines “funnel” people to the other side without much conflict. 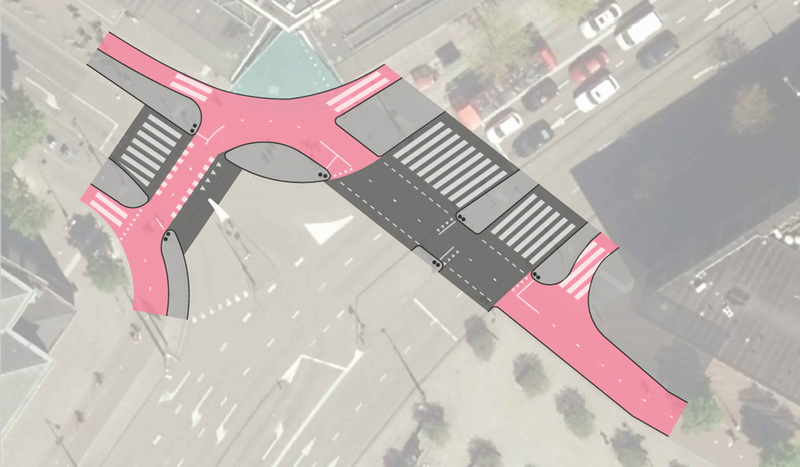 The crossing is cleared quicker because of this design. The cone-shape has a positive influence on the time it takes for the crossing to be cleared. People can wait side by side and due to the diagonal lines and the differences in speed, cycling is “funnelled” towards the other side of the street. This is a very Dutch solution to a very Dutch problem. The Dutch aren’t very good at forming an orderly queue. Instead they will all try to stand side by side at the stop line. You can try to nudge people to do something that doesn’t come natural to them, but that usually has limited success. Now their natural behaviour was facilitated and that does work. Finally people cycling aren’t treated like mini-cars. There is no way you could funnel motor vehicles like this, but for people cycling this comes natural. If you look at the video, you will see that there is almost no conflict with the approaching people, for which this works exactly the same. As a result of the quicker cleared crossing the green times could be shorter, which in turn means shorter red times for other directions. In total this increased the traffic throughput considerably. The new cycle space in purple. 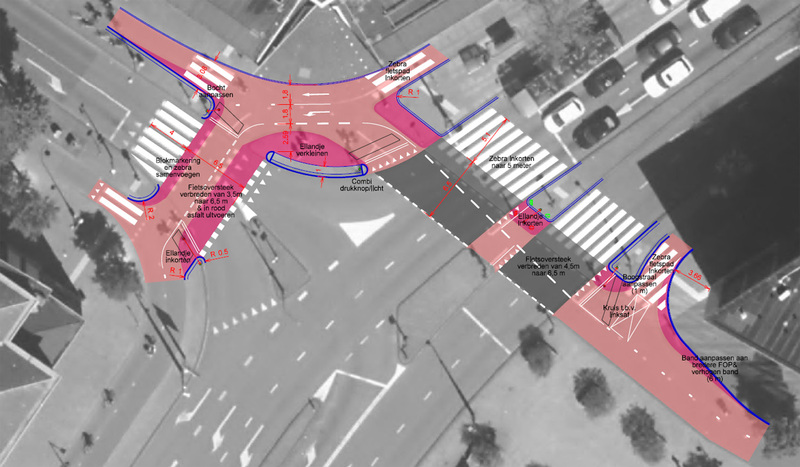 It is clear that a lot of space could be gained without enlarging the total footprint of the intersection. There is now 33% more space for cycling. (Picture city of Amsterdam). Enlarge to see the measurements. In the former situation 421 square metres were designated for cycling. With all the measures in place that space increased by 33% to 559 square metres. An increase of 138 square metres. Alongside the banana-shaped island there are now three cycle lanes. There is a waiting lane of 2.59-metres-wide and there are two cycle lanes of 1.8-metres-wide for the opposite direction. One lane for cycling straight-on and one left turning lane. Some traffic light posts had to be relocated and many road markings had to be changed. All the cycleways got a new layer of smooth red asphalt. The space for motor traffic was not changed at all, and neither was the asphalt there. You can still see where the old markings were removed at the crossing, which makes it easy to see the differences. All in all this was a relatively minor change to the intersection, but with considerable and positive consequences. It is a great example of what you can achieve with innovative solutions even when there is only limited space and a small budget. The Banana and the French Fries Cone at the Amsterdam Mr. Visserplein. This post was updated one day after the original posting with two new pictures that a representative of the city of Amsterdam was kind enough to send me because they are more detailed and could interest my followers. Taking space away from the pedestrian traffic to get more space for bicycles. Do we need such car-friendy ‘solutions’ in the 21th century? That’s not what’s being done here. The space was taken from the buffers. These buffers were needed before the bicycle was the first vehicle of choice. Needed to make it the first vehicle of choice. Are the cycle paths at the same level as the carriageway or in between the carriageway and the footpath? Thankyou for a thorough explanation of a unique solution and the underlying thinking. I needed to look at all the diagrams and the video before I got it! Thank you for this posting! I heard of “frietzakken” some months ago and it took a while before I found its meaning. You wrote: “The Dutch aren’t very good at forming an orderly queue.” There are several reasons for that to my experience. Mainly because we are smart **ses. It increases the capacity: if you accelerate fast you can pass quickly without annoying others. In morning rush hour I do it a lot at one particular crossing whre there is enough space to swarm out. It fills the crossing fast too. Passive queueing introduces a lot of waiting time which conflicts with often very short green phases. On my route to De Uithof there also is a rush hour situation where the main cycle route gets very short green phases. Only if you are within 25 m of the crossing you can reach the end of the phase (5 seconds). What a brilliant idea! I admire the openness to an innovative solution. 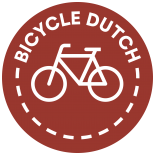 This entry was posted on 10 April 2018 by Bicycle Dutch in Original posts and tagged Amsterdam, innovation, junction design.